Heat oven to 350°F. Line large cookie sheet with foil. In large bowl, stir butter, lemonade concentrate, lemon peel, lemon extract and eggs until well mixed. Add remaining ingredients; stir until soft dough forms. Divide dough in half. On cookie sheet, shape each 1/2 of dough into a 12x2-inch log. Bake 25 to 30 minutes or until edges are golden brown. Cool 15 minutes. Carefully lift foil to move cookie logs to cutting board. With serrated knife, carefully cut each log crosswise on a slight diagonal into 3/4-inch slices. Place slices cut side down on cookie sheet. Bake 15 to 20 minutes, gently turning cookies over once during baking. Cool 2 minutes; remove from cookie sheet to cooling rack. Cool completely. Store loosely covered at room temperature. 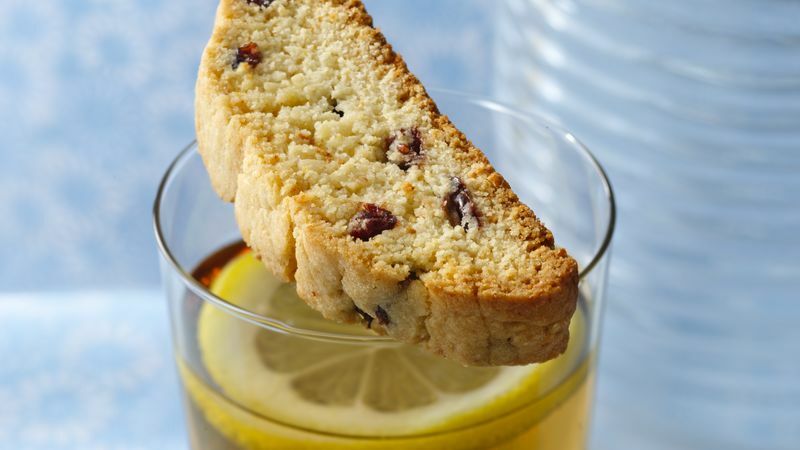 "There's nothing quite like the crunch of biting into a biscotti, and this cookie brings the flavors and sunshine of summer with each bite." Sprinkle baked biscotti with powdered sugar.